In the 17th century City Hall Park was just a small meadow at the edge of the city, known as the Commons. In 1871 a large fountain was installed in the park, the Jacob Wrey Mould Fountain. 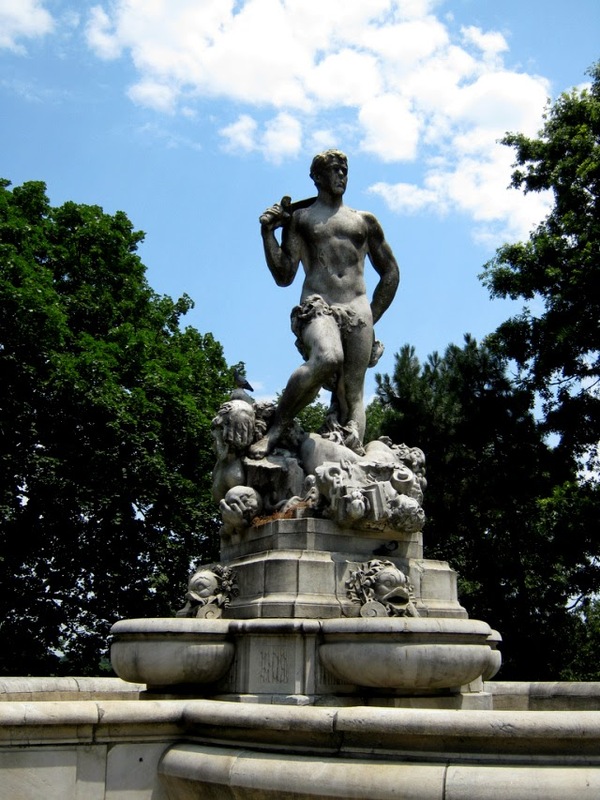 In 1920 fountain was disassembled and shipped to Crotona Park in the Bronx. 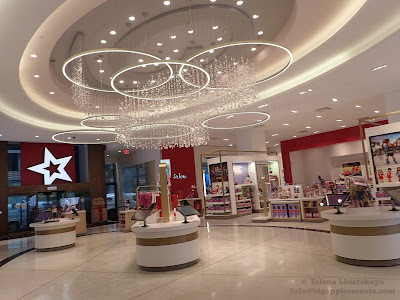 You can read the beginning of the story in my post here. 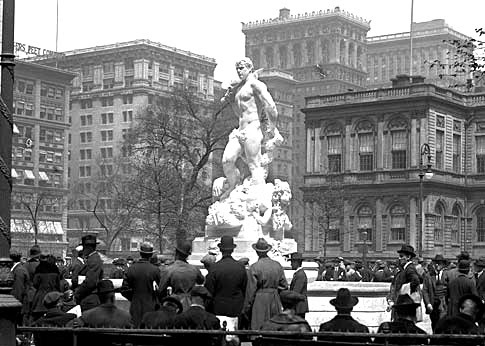 Two years later a fountain with a sculpture “Civic Virtue “ by expatriate American sculptor Frederick William MacMonnies was installed. MacMonnies is also the author of Nathan Hale memorial in City Hall Park, dedicated in 1893. In late 1917 MacMonnies was commissioned to work on a sculpture in honor of those that died in the Battle of the Marne as a gift to the French people in exchange for the Statue of Liberty. Mayor Fiorello LaGuardia hated the fountain because its naked backside could be viewed from his office. In February 1935, Parks Commissioner Robert Moses insisted Civic Virtue should be removed from City Hall Park. He wanted to reconstruct the original fountain. In January 1941, Robert Moses announced a contract of $21,720 for the statue's transport, and on May 29, 1941, the 24-ton statue was placed in a wooden container, meticulously packed with sand and attached to a crane. At 2 miles-per-hour, it made its cross-town parade on a 16-wheeled haulage truck with stout timbers to Kew Gardens. 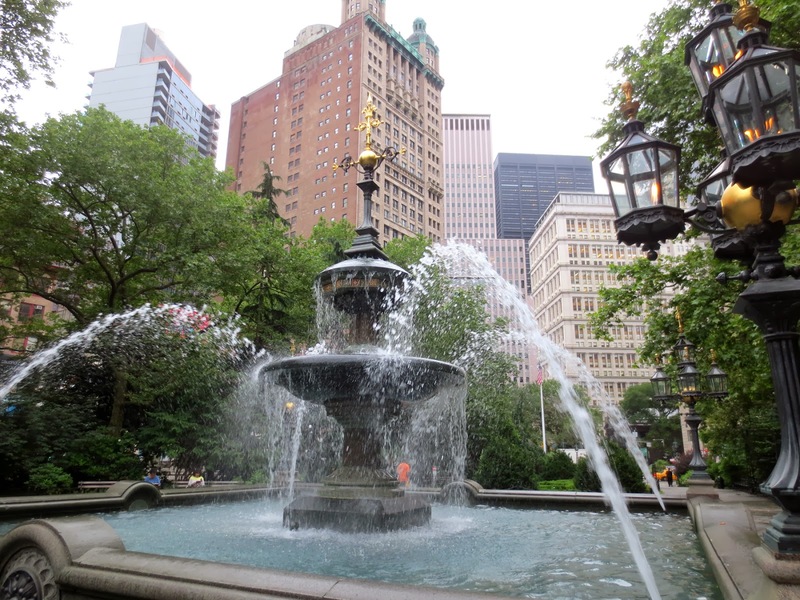 City Hall Park was without a fountain for 30 years until 1972 when a new fountain, a gift of philanthropist George T. Delacorte, was installed. Mr. Delacorte, the founder of Dell Publishing and a philanthropist, who gave millions to enhance New York City with fountains, statues, theaters and schools that bear his name made. There are Delacorte Clock, Delacorte Fountain and Delacorte Amphitheater in Central Park. During his second administration in 1999 Mayor Rudolph Guiliani became disappointed with the rag-tag condition of City Hall Park. He initiated an all-out renovation and restoration. The Delacorte fountain was moved to the Bronx at Borough Hall Park. Conservations Solutions, Inc., was hired to restore the fountain made by Jacob Mould, sitting for years in Corona Park, Bronx. All of the bronze elements from the fountain had been stolen. The vandals sprayed graffiti on the fountain, and it had been covered over by layer after layer of white paint. All missing granite, bronze and ceramic elements were reproduced using Mould’s original sketches and photographs. 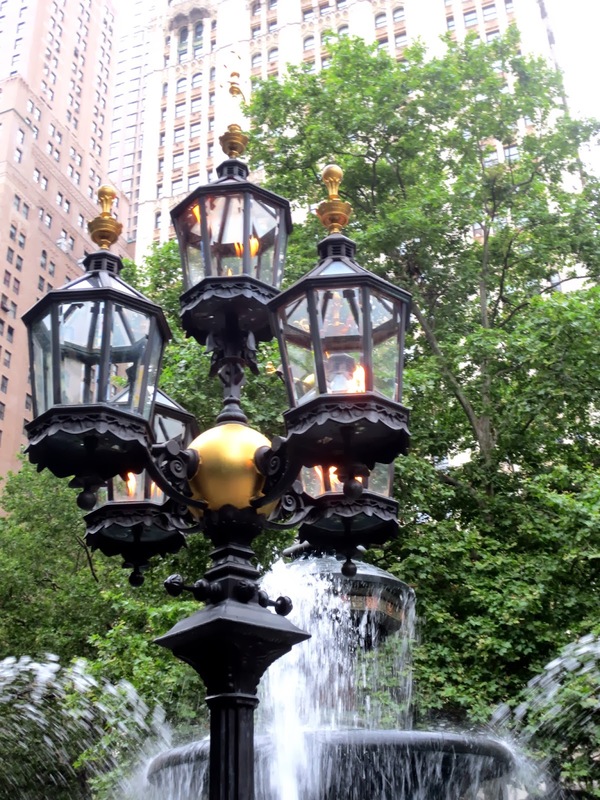 Not only were the fountain operations restored to the 1871 plans; the restored lamps burn gas again as they did during those summer concerts 140 years ago.